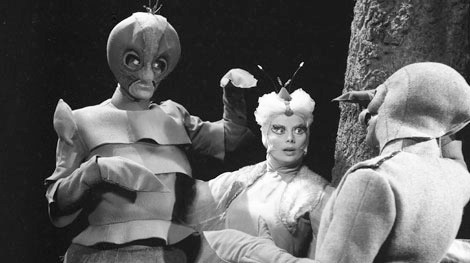 How even to start writing about the 1960 BBC studio production of Karel and Josef Capek’s The Insect Play? This was shown last night at BFI Southbank in the season dedicated to the archive rediscoveries from the Library of Congress — and, yes, it really is as bad as these stills might suggest. Judged against even the most sympathetic evaluative standards of today, it is indeed laughably dreadful. What appears to be a text (premiered in 1922) that is at once pretentious and incoherent is played in tatty am-dram costumes by a cast that mostly hasn’t a clue quite what they’re doing. The Czech original is an allegorical satire about human nature (and indeed is the inspiration for a forthcoming film by the great Jan Svankmayer) but under Hal Burton’s direction, and especially as given in his simply silly design scheme, it is hard to think that fifty years ago anyone watched to the end. ‘Life is beautiful,’ seems to be the overall import of the play — and it’s beautiful because of the never-ending cycle of birth and death common to insects and humans. A philosophical and far-from-sober tramp (Patrick Macalinney) falls asleep in the woods and dreams of encounters with butterflies (one of whom is a poet), beetles (concerned only to acquire wealth — in the form of dung), crickets (easy prey for the ichneumon fly) and ants (in the play’s most effective sequence, drones being driven into futile war). At the end, the tramp dies (sorry about the spoiler) and a newborn baby is taken to be christened. Writing in The Listener at the time Irving Wardle observed that the play ‘has repeatedly proved itself a natural radio work’; he also suggested how it might be made to work in visual terms. And yet, and yet. 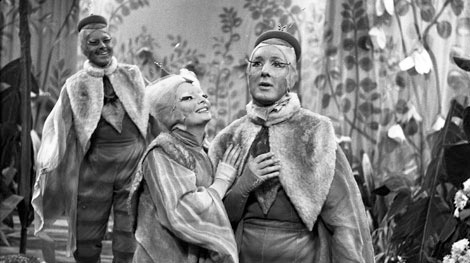 This was the second time that BBC television had presented the play (the first was in May 1939, in a production by Stephen Thomas) and in 1960 it was allocated considerable resources. ‘The production will be staged in two studios,’ Radio Times reported (17 June 1960, reproduced in BFI Southbank programme note), ‘of which one will be entirely occupied by the elaborate flying apparatus which has been installed to cope with the butterfly sequence.’ Which sounds rather more impressive than the two very brief ‘flying’ shots actually achieved with said apparatus. We saw the chrysalis, which the tramp had been encouraging throughout the play, finally break out as a beautiful moth. She danced around in joy and in a few moments died. The tramp wonderingly picked up the body and laid it in the palm of his hand. What other medium could produce this moment so tellingly? The cinema, I suppose. But the cinema would not do The Insect Play. Even if Peter Black, for this critic fifty years on, is far too generous (the transitions from chrysalis to dancing human moth to dead real moth are just clunky), his central point is an important one. But within three or four years, as the BBC followed ITV in an almost exclusive embrace of original contemporary scripts for one-off dramas (in series like The Wednesday Play) not even television would return to The Insect Play. 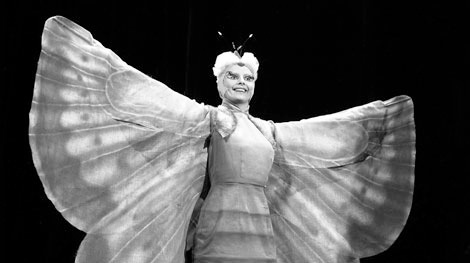 I’m pretty sure that I’ve seen a BBC Audience Research Report for The Insect Play, in which 1960 audiences were no more enthusiastic than 2011 ones. It was quite close to the lowest audience appreciation figures that I’ve come across (that being 23 for ‘The Bald Prima Donna’ in 1963, though there was a 1951 production of Christopher Fry’s ‘A Sleep Of Prisoners’ that is cited as being the record holder least-appreciated production). Its certainly not a play that fits very easily in the mostly West End repertory of ‘Twentieth Century Theatre’, the umbrella series in which it was transmitted. If you want to see the natural follow-on from The Insect Play, now would be the ideal time to watch the Capeks-inspired 1965 Doctor Who story, The Web Planet. Just imagine – six whole episodes of William Hartnell trying to maintain his dignity alongside of giant-sized ants, butterflies and woodlice! Thanks, Billy – and somehow I’m not surprised. I’ll certainly try to track down the report in my next trip to the Written Archive Centre at Caversham. And I’m grateful for the Doctor Who reference, although after an hour and a half last night I do think I’ve had enough televised insects for a while.